One of my year resolutions – and the list keeps growing – is to eat healthy. That is why this year, I will post one easy healthy receipt a week so I can somehow motivate you ad myself to this adventure of changing eating habits. 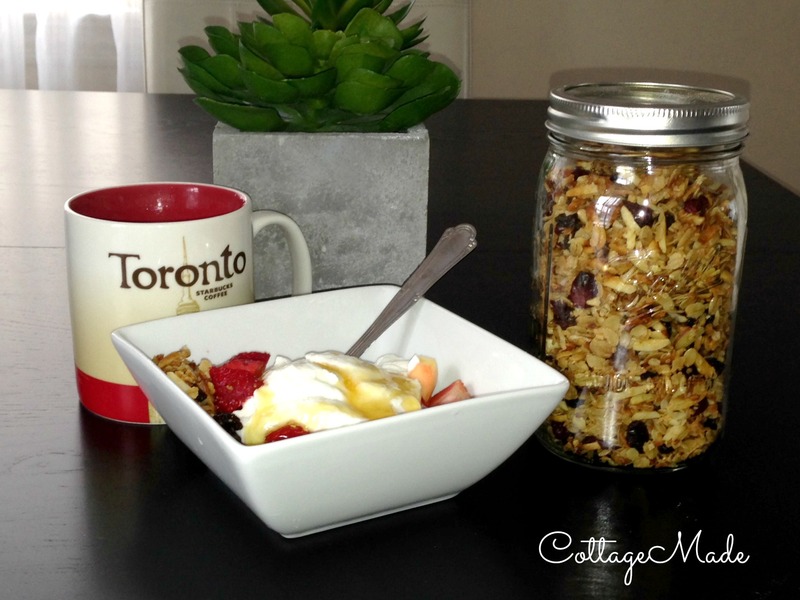 Today I’ll share this Homemade Granola recipe that I have been cooking the past few weeks. I take no credit on this. The recipe was given to me by my neighbor. She eats very healthy. She presented all the neighbors with a lovely container with some granola for christmas. It tastes soft and fresh. She was very kind to share the recipe. I love granola. I have it every morning, for breakfast with cottage cheese, fruits and honey…hum.. yummy! This is a VERY easy recipe, takes me no longer than 30 minutes to get it done from prep to cooking. Optional: other types of nuts you’d enjoy toasted such as chopped walnuts. Alice, dei uma traduzida rapida. O que vc nao entender me diga…muitas coisas sao opcionais. No precisas poner todo. Solo la aveia, miel, coco y oleo es lo principal. El resto podes cambiar o no poner. Yo solo uso nozes y uva passa.